Da Nang (VNA) – Representatives of the US Agency for International Development (USAID), Vietnam’s Ministry of National Defence and Air Defense - Air Force signed a deal on August 9 to hand over 12.7 hectares of land, which had been cleaned up from dioxin contamination at Da Nang airport, to the Ministry of Transport for management. 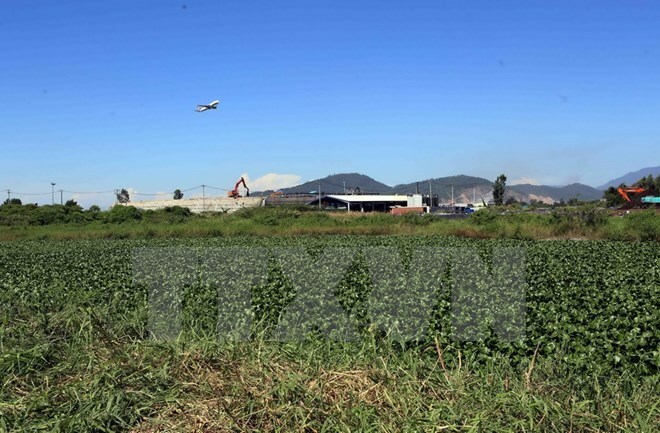 This is the second handover of detoxified land for the expansion of the airport as the USAID and Vietnam’s Ministry of National Defence are cooperating to disinfect dioxin-contaminated land and mud at the area which used to be a US air base. The governments of the US and Vietnam have been joining hands to deal with dioxin contamination in Vietnam since 2007. Launched in 2012, the dioxin detoxification project at the Da Nang airport is an important milestone in bilateral cooperative relations. The project has successfully treated 94,000 cubic metres of contaminated land and mud and it is expected to be completed in early 2018. At that time, all health risks posed by dioxin exposure will be removed. Senior Lieutenant General Pham Ngoc Minh, Deputy Chief of the General Staff of the Vietnam People’s Army, said the Da Nang airport is one of the three “hotspots” of dioxin contamination in Vietnam. The airport is located at a strategic position in terms of both security-defence and socio-economic development of Da Nang and the entire central region, he said. The second-phase handover of land is the joint achievements and efforts of the Vietnamese Government, the Ministry of National Defence and the USAID to implement effectively the dioxin detoxification project using non-refundable official development assistance (ODA) from the US Government, he added. In May 2017, after completing the first phrase of the project, the Ministry of National Defence handed over 5.97 hectares of land to build a taxiway and an expanded apron at the airport to serve the APEC Economic Leaders Week in Dang Nang later this year. The dioxin detoxification project is due to be completed in the first quarter of 2018. After that, the defense ministry will hand over the remaining land area of about 16 hectares to the Ministry of Transport for the expansion of the airport in line with a planning scheme approved by the Government. The ministry will continue working with the USAID to implement a dioxin treatment project using ODA provided by the US Government at Bien Hoa airport – another “hotspot” of dioxin contamination. The latest statistics showed that nearly 6 million hectares of land across Vietnam are contaminated with bombs, mines and dioxin. To create the best legal and institutional framework for the clearance of bombs, mines and toxic chemicals left over from the war, Prime Minister Nguyen Xuan Phuc has signed a decision to establish a national steering committee. In September 2017, the defense ministry will officially launch a Vietnam-Republic of Korea project to address bomb and mine consequences using non-refundable ODA worth 20 million USD from the Republic of Korea.